The Milwaukee Brewers‘ version of musical bullpen chairs continued Saturday as the team added a fresh arm in Aaron Wilkerson while sending down Adrian Houser. The right-handed Wilkerson was summoned from Triple-A Colorado Springs, where he has a 2.49 ERA and 1.30 WHIP in 12 games, with nine starts. This will be Wilkerson’s fourth stint with the Brewers this season, having allowed 10 runs in 9 1/3 innings with Milwaukee. Houser’s fifth stint with the big club was a short one. He was called up Friday after Joakim Soria went on the disabled list and pitched 2 2/3 scoreless innings in that night’s loss to Atlanta. 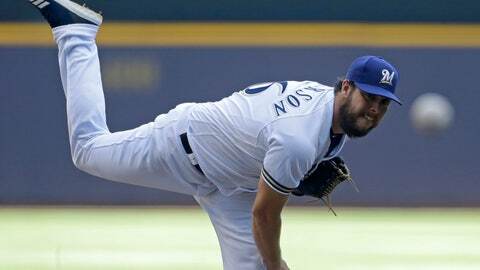 Houser now owns a 3.29 ERA in 13 2/3 innings with the Brewers this season.